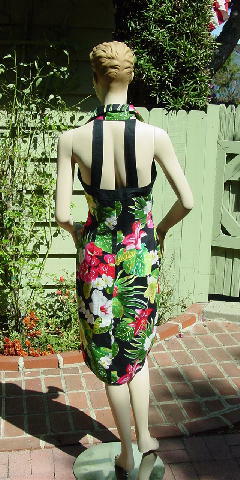 This striking vintage sundress has a halter neckline and 2 adjustable back straps. 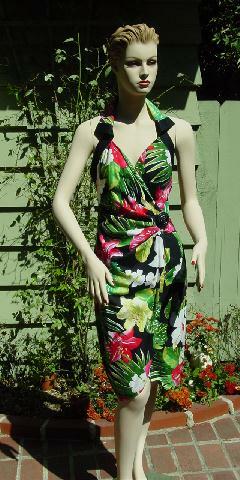 There are large red, pink, yellow, and white tropical flowers with green leaves on a black background. The criss-cross velcro closing in the front is adorned with a large textured black button. The left panel is secured to the right side seam by a button and the crossover panel has a button right next to the velcro closing. A model wore this on the days she was working because it's easy to put on and take off. She loved it and it was perfect in Miami, but she wore it so many times that everyone had seen it. Wear it in warm weather - it's perfect over a bathing suit. bottom of armpit to hem 33"
bottom of armpit to center of black button 7"
top of shoulder to bottom of armpit 7"
2 back straps from neckline to center of 1st buttonhole 11"
2 back straps from neckline to center of 2nd buttonhole 12 1/4"